I have the great privilege of pastoring, in my opinion, the finest church communities in North Carolina. Okay, I’m being a bit too modest. I pastor the finest congregation in the world. Not once in the almost six years of pastoring Mosaic Church of Clayton have I awoken with the thought, “Man, I really don’t want to go to work today.” I simply love what I do. I love the people I work with. Our Mosaic community combines a brilliant mixture life, faith, and ministry. A little over two years ago, Harry Rowland and Bo Prosser invited me to make one of my biggest dreams become a reality: to work with the Cooperative Baptist Fellowship. This denomi-network first embraced my calling as a church starter and supported Mosaic with abundant care and resources. These are two of the most formational mentors of my life. You bet your bottom dollar that I jumped head first into that opportunity. In addition to the brilliance of the Mosaic community, I get to work with innovative and creative people on a daily basis. If you have never spent 20 minutes with Ruth Perkins Lee, Josh Speight, Aaron Weaver, or many other CBF staff, then there is a huge hole in your relational repertoire. When you add in the excellent church starters I partner with, I’m going to ask that you not become too jealous of my vocational circumstances. Now, you must be thinking, “There has got to be a downside to all of this work, right?” Excellent question. Between pastoring Mosaic and coordinating CBF church start endeavors, I constantly pull in a 60-70 hour week. Let me reiterate that I’m not trying to be self-aggrandizing, but I confess that I at least try to manage it well. I’m almost never behind on projects. I have sermon manuscripts written at least one month out. Furthermore, I try to maintain a healthy connection with my parishioners. I’d like to believe that I do what I do well. I know what he is going to say next. His family suffers from all this work. I somehow manage to pick up my five year old from preschool three times a week, as well as attend her gymnastics class once a week, cook and eat dinner with the family most every night, sit down on the couch and catch up on our days with my wife, and kiss both our daughters to sleep most nights. Do I have room for improvement before I can reach the dad or husband of the year award? Who doesn’t! It’s his health. He’s going to tell us that he runs into a number of stress related conditions. I could stand to lose 15 pounds, but I somehow manage to fit in five to six workouts in a week. However, about a month ago I discovered a downside to all of this. I was not maintaining a healthy balance of self-care on a regular basis. It is all too easy to not make up for missed “time off”, to not cut off the email and text influx during family time, to not shut off self-critique over all of your work and constantly try to find a way to improve everything that you do, to not properly process challenging conflict, to lose sight of why you do what you do, and on and on. I know these things. I was taught that self-care was important from seminary on. I’ve even taught workshops on the topic. But I found myself on the brink of a burnout in May of this year. I was tired and frustrated. So there it is, there is the downside. I failed to maintain a healthy balance of self-care on a regular basis. It didn’t take me long to realize what I needed. It was time for a spiritual renewal week. At first, my type-A personality took over and I began to plan this week “so perfectly.” I quickly realized that taking a break from planning was one of the ointments my soul needed. So I resolved to build four simple components into my spiritual renewal week: 1) taking a break from all technology (texts, emails, social media, and the like); 2) engage in deep thinking and spiritual reflection; 3) proper family time; 4) peer encouragement. So I planned a simple 3-day hiking trip to the Appalachian Trail, a gathering with my ministerial peer learning group, time with a couple who is deeply encouraging to my family, practicing the simplicity of presence with my girls, and all of this wrapped around five days of prayerful reflection. After preaching on Sunday, I headed to Mount Rogers, Virginia, to hike the Appalachian Trail for a couple of days. I’m an outdoorsman. I love hiking, camping, and adventurous circumstances. I figured this is what my soul needed, a couple of days by myself on the trail, writing, reading, and reflecting. 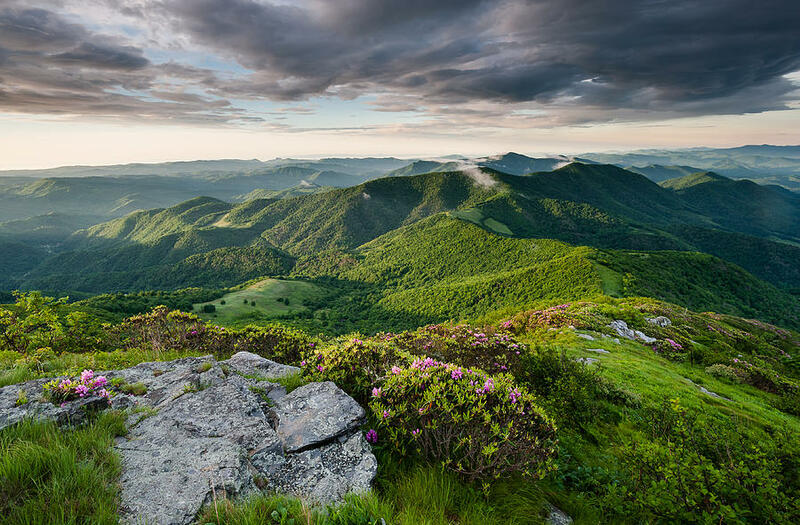 On day one, I made it to the summit of Mount Rogers where wild ponies roamed, pungent rhododendron were everywhere, and rolling hills sprawled as far as the eye can see. The Grayson Highlands were absolutely beautiful. I set up camp, hiked the trails, and ate dinner. Around 8:30pm, I jumped into the camping hammock to read the Gospel of John and to write. While reading about Nicodemus, a member of the Jewish ruling council who came to Jesus one night, I realized that I was unequivocally distracted. I turned back a page and picked up where I had last remembered soaking in the words, only to find myself distracted yet again. What was my deal? I needed this. I needed time away. I needed spiritual renewal. And then it hit me what was distracting me. While I’m swinging in a hammock in the middle of the Appalachian Trail, there are two little girls and a wife in Clayton who would love nothing better than to have their daddy and husband home. And then the biggest revelation came upon me. I realized that it was not just them that needed me, but I needed to be home with them. If I was going to be the best pastor I can be, the best follower of Christ, the best coach and consultant, then I needed to be the best husband and father I can be. I looked at my watch; it was almost midnight. I slipped out of my hammock, ready to pack up camp, and hike back to my car. Unfortunately, it was pitch black and there was a dense fog filling the area—not ideal circumstances for hiking 6.5 miles of mountainous terrain. I woke at daybreak, broke camp, and hit the trail. I called the girls and told them my plans for the day would include a good bit of reading and reflecting, and that I would call them when I set camp for the night. I figured a little white lie would be okay for what I was about to do. I got to my car around 9:00, hit the road, and arrived home after noon. The girls were away, so I sat down on the front porch to await their arrival. My wife’s face was one of shock and sheer happiness at seeing me sitting on the front porch when I was supposed to be on the trail. My girls’ faces shown pure joy. I can only imagine what my face looked from this pitch-perfect reaction to my little surprise. They tell you that self-care is important, but what I came to realize over five days is just how important and dynamic that truth can be. Sometimes what we plan to be a deeply theological learning and reflection can be trumped by the simplest and unexpected spiritual practices. As I stated before, I realized that if I wanted to be the best follower of Christ and pastor, then I needed to the best father and husband I can be. I needed time with my girls. Let me clarify. I needed unplugged, distraction-free, and intentional time to invest in three people who God has given for me to care for and to be shaped by. So walking adventures, dressing up, deep conversations, coloring, and cooking meals together abounded. I met that week with my peer-learning group. I shared my celebrations and struggles, as well as listened deeply to their stories. My soul needed affirmation of calling and self by this community of fellow ministers. Our family gathered with another couple that simply loves us for who we are. We spent time together without an agenda. My soul found encouragement and joy. I spent quality time, for the first time in a long time, reflecting on life, faith, and ministry. I found renewed satisfaction in my pastoral calling, a deeper appreciation for my love for the Mosaic community, and new insight into my worth among those I am blessed to work alongside. I learned that self-care needs to be practiced consistently, not just when I can get around to it. So here is to sticking to it in the weeks to come. If you thought this story was steering in the direction of finding myself in the wild, like a Cheryl Strayed who hiked the Pacific Crest Trail or Christopher McCandless who left everything to trek across America and live in the Alaskan wilderness, I apologize for boring you with my five days of spiritual renewal. Don’t get me wrong; I’d love to hike the entire Appalachian Trail or the Pacific Crest Trail, but I’ve got a calling to fulfill. It is the calling to be a genuine follower of Jesus, a husband to the most intriguing and beautiful woman on the planet, a father to two fascinating little girls, a pastor to a brilliant congregation, a co-worker to innovative people, and a good friend to some.